Time To Stick It To Corporate America! 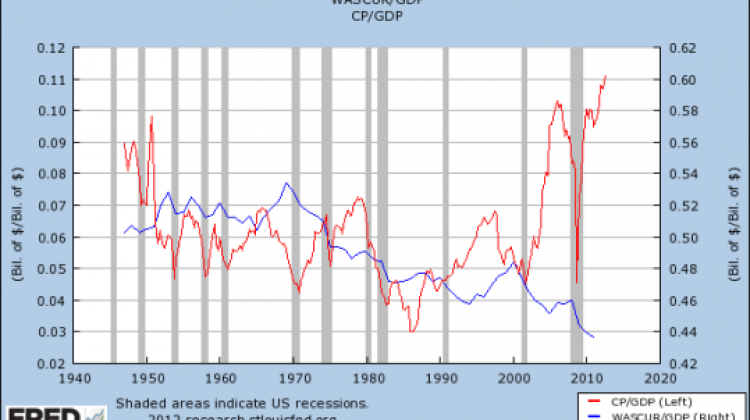 The red line indicated corporate profits and the blue is the average wage of Americans. As you can see the profits have been sky rocketing to record levels, while wages continue to plummet. In the third quarter, corporate earnings were $1.75 trillion, up 18.6% from a year ago, according to last week’s gross domestic product report. That took after-tax profits to their greatest percentage of GDP in history. But the record profits come at the same time that workers’ wages have fallen to their lowest-ever share of GDP. So we have to record breaking pieces of information here; profits are at record highs and wages are at record lows. This comes at a very critical time in our nation. With the fiscal cliff less than a month away, many on the right are content with middle class taxes going up, just to save the corporations some tax money. The thinking is the same, failed logic that GOP has been pushing for years; “if corporations have more money, they will hire more.” It goes against the very basis of supply and demand economics and is a proven failure just by this data. The corporations do have the money, but they aren’t hiring and they aren’t paying. We need President Obama to stick to his guns. We need a much more progressive tax code that does shift the burden from the struggling middle class to the comfortable upper class. We also need a tax code that pushes corporations to share their wealth by distributing it down to their workers. If they don’t want to, then the government will punish them for it. In other words, we need to make “trickle down” work and the only way to do that is through the tax code. If that don’t happen then we can go ahead and start filing in the grave of the American Dream.